Providing informal fun events for Library & GLAM people in Canberra & surrounds (ACT, Australia). Rainbow Storytime on Saturday, whether rain, hail or shine! Rainbow Storytime tickets available! Free, but we’d love your RSVP! Rainbow Storytime, Save the Date for Saturday 18 March! This post is part of our short series of interviews with people who volunteer in the GLAMR industry (Galleries, Libraries, Archives, Museums, Records). The series began with our participation in #blogjune, but there are too many to restrict them to just one month! These stories will highlight the copious volunteering opportunities across Canberra, and showcase our local volunteer heroes. You can also find out how to volunteer. 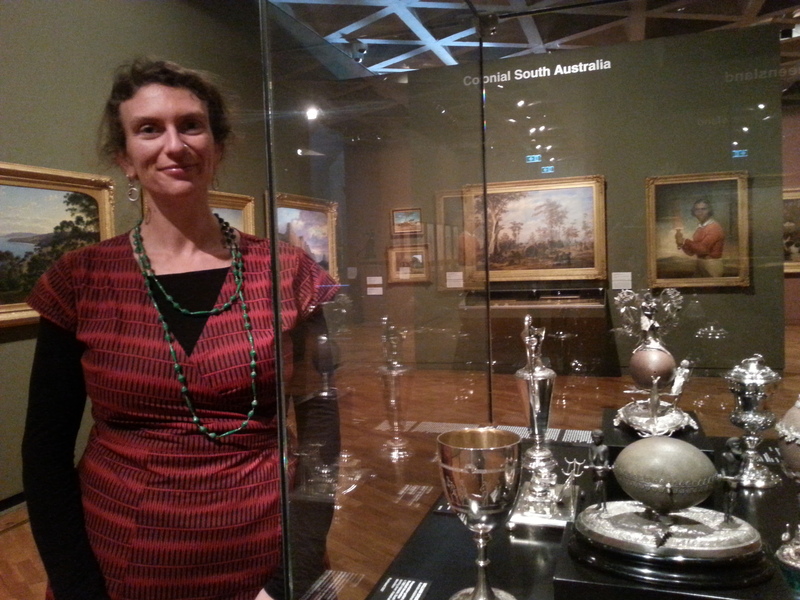 Our tenth interviewee is Christina Clarke, who volunteers for the National Gallery of Australia. I’ve been working at the National Gallery of Australia’s (NGA) Research Library with documentation and archives for five and a half years but I’m actually an archaeometallurgist – an archaeologist who specialises in metalwork. I finished my PhD on prehistoric Greek metalwork in 2012 and it’s been a struggle to find work in my field. I wanted to do some volunteer work to expand my skillbase and I asked a colleague at the Gallery if she knew of anything coming up. It was just pure coincidence that we had recently acquired a massive collection of early Australian silver from collector John Houstone and someone was needed to work on the records in the Gallery’s collection management system (CMS). It’s a data entry role, but every item in the collection must be measured and examined for makers’ marks, and the manufacturing techniques and materials described. This means that I handle every item, and there are hundreds of them, perhaps a thousand. Having a library background means that I have a good grasp on data entry standards, but I have the expertise necessary for analysing metal antiquities, so it’s pretty much the perfect volunteer role for me. Metalwork is my passion, and I’m just so happy to be able to be able to work with it every week! Especially with a collection like this one which contains the work of some of the earliest silversmiths in Australia, so it has a lot of historical significance. People joke with me that I must be sick of teaspoons (there are hundreds of them in this collection), but I secretly enjoy every single one! Another great thing about this role is that I get to work with people and in parts of the Gallery that I’ve never had anything to do with before. I liaise with art handlers, conservators and the Curator for Decorative Art and Design, as well as the team who manage the Gallery’s CMS, KE EMu. I’ve gained some great new skills and have learned so much. What are the benefits of volunteering for the Gallery? What kind of projects and activities do you anticipate in the future? The Gallery is just a great place to work and volunteer. It’s lovely to be part of a national cultural institution where, no matter what job you’re doing, you’re contributing to Australia’s cultural history. It also has a fairly small workforce, so you get to know most people’s faces, even if you never work with them. Another great benefit, of course, is all the wonderful art. Working in the office you tend to forget that there’s an amazing collection of art just a couple of doorways away, so I love to wander through the exhibition spaces now and then to remind myself of what all the hard work is for! For the future, well I will probably still be examining and cataloguing this silver collection until the end of the year, and after that there will still be some work to do tidying up the records. I’ve also been developing some research projects based on the collection which will lead to some scientific papers for publication. My academic interest has always been in prehistoric European and Middle Eastern metalwork, but as you can imagine there aren’t many avenues for that research in Australia! I think that there’s a lot of scope for research into Australian colonial silver. What is the most enjoyable aspect of your volunteer role? Working directly with items in the NGA’s collection is definitely a highlight. I’m particularly happy to be working with metal objects but, frankly, I’d be happy working with anything in the collection! It’s also great volunteering in the organisation you work in because you learn about other aspects of the place, which makes your own job more meaningful because you see your work in a greater context. Do you have a favourite collection item? Or have you learnt interesting things from doing data entry in the CM? I don’t know if I could single out one item from the hundreds I’ve dealt with so far! A couple of fun things with engraved inscriptions come to mind. The Ryan Tea Service was presented to Captain Valentine Ryan by the passengers of a ship he captained between Portsmouth and New South Wales in 1836 “in acknowledgement of his unremitting attention and kindness during the voyage”. He must have been a very kind chap to earn a gilded silver tea service! Another wonderful item is a silver medal awarded to one Mr Moses Moses by the inhabitants of Yass in 1842 for trying to capture the bushranger Massay “in which he only failed by not being supported by the Constable present upon whose assistance he naturally calculated”. These funny little stories really bring life to the objects. Some of the items were owned and used by significant historical figures, and it’s humbling to work with them. Could you share some tips for people wanting to do similar volunteer work? I really lucked out with this opportunity because it just happens to require a combination of skills and expertise which I happen to have. Others would find it tedious, but I look forward to it every week. If you’re a younger person who’s looking for volunteering opportunities to increase your skillbase, I’d say think about what direction you want your life or career to take and ask around about opportunities in areas which will carry you in that direction. It’s also a matter of being able to contribute something, of course, so make sure you have some relevant skills to bring to the table! Some of the best mature age volunteers I know have professional experience in their area, and they really are invaluable. How do people become a volunteer at the National Gallery of Australia? To find out about volunteer project work opportunities (which can be really varied) with the Gallery, please phone the Volunteers/Guides Coordinator on 02 6240 6588. Many of the volunteers at the Gallery are Voluntary Guides, and provide daily public guided tours of the exhibitions. They undertake a year-long education program in art history and, upon graduation, commit to guiding once a week for at least three years. You can find out more about applying to be a Voluntary Guide on the Gallery’s website.